The development of the air quality sensor, with a primary focus on NOx is progressing. In our joint collaboration with Assoc. Professor Christoph Langhammer and post doc Irem Tanyeli at Chalmers, a coating sensitive to NOx has been developed. In the meantime, Insplorion will focus on business development and hardware components for the sensor system. The sensor will be useful in several different applications, and the team has found new ways of building cheaper and more robust measurement setups. Below two of our prototypes are shown: the first one to the right, and our most recent one to the left. 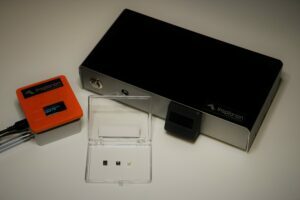 Both these systems will, at different costs and performances, be of use for air quality monitoring; the smaller one is now even more versatile, being the size of a smartphone, and perfect for hand-hold sensing. The components in the transparent plastic box illustrates the potential of how small the unit can be in the future. These three low-cost parts are the core of the sensor system: an optical detector (left), the NPS sensor (middle), and a simple light source (right). When put together and attached to a circuit board, they produce a very tiny, cheap, and robust sensor. The orange prototype was this week tested in the laboratory at Chalmers, and will be part in further field tests in Santiago, Chile, next week together with the LoV-IoT community we are part in. See you then!